This shot was taken in The Peoples Garden located just on your right hand side as soon as you enter the park through the main gates at Parkgate Street. You probably pass it all the time as you go towards to middle of the park. To be honest it doesn’t really look like much from the road but if you have a bit of time to go and explore it then I highly recommend you do so. You can park up near the Zoo and just walk back down, if you are walking then just head straight in after the main gates, you will see lovely old cast iron gates into the gardens pretty much as soon as you walk in the main gates. It does however get very busy during the summer months but in Spring or Autumn you will have the place pretty much all to yourself. In the winter months you will be lucky to meet a lost dog even. The gardens have a wonderful small lake / pond, to be honest I have never really been sure what the difference is between a pond and a lake, is it something to do with size. Is a large pond a lake and a small lake a pond. I was actually on a mission to take pictures of the Wellington Monument on this particular day but I think you will agree I just couldn’t walk away from this scene without at least taking one shot. This I literally did, I promise I only took one single shot and thankfully it worked out for me. The light was just amazing on the trees, it just didn’t seem to be hitting any other surface in the park. It was quite late on a beautiful sunny December afternoon and I was on my way back to the car at this stage. I thought I would unwind after a hard days shooting [don’t worry I’m not expecting any sympathy] and maybe just have a wee sit down on a bench in the Peoples Garden. Sometimes it’s hard to kick back and relax when you have a big camera strapped to your back. To purchase a signed 11 x 11 inch print of this photo, just click the button below. 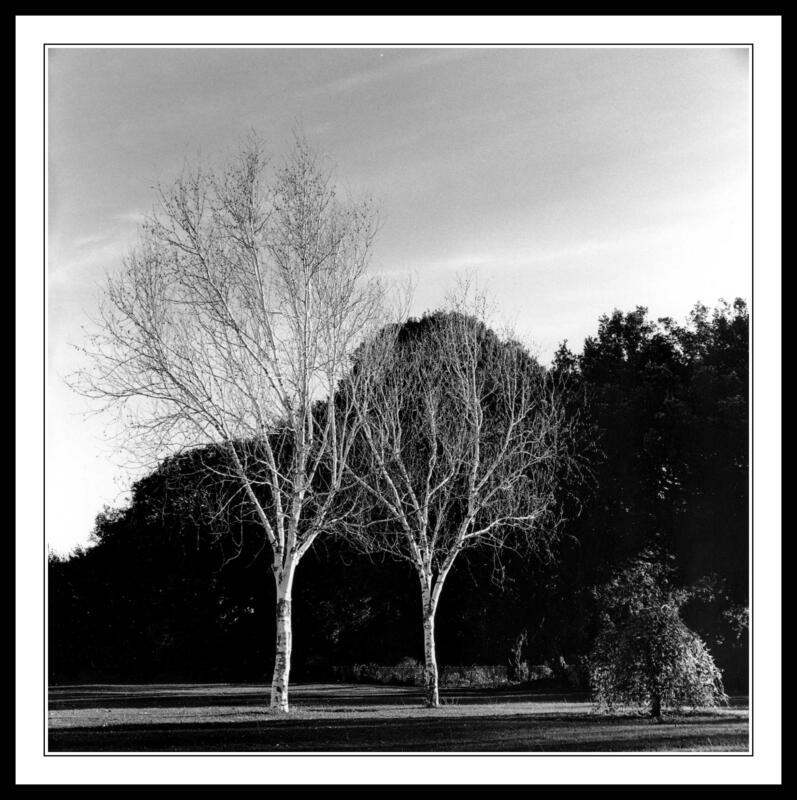 This entry was posted in Black and White Photography, Film Photography, Irish Landscapes, Phoenix Park, Photography and tagged Black and White Photography, bronica medium format, Kodak Tri-x, Medium Format, Peoples Garden, Phoenix Park, Photography, Silver Birch. Bookmark the permalink. Yes, I will wholeheartily agree that the light was supurb on the silver birch. It makes it shimmer. 🙂 Beautiful capture. Thank you for sharing this moment of beauty. It was funny, literally five minutes after taking the shot I was taking my equipment down and I could see people looking at me very strangely trying to figure out what I could interesting in front of me. As soon as the light moved it was just two boring old trees sitting in a park.